I'm thrilled to announce this upcoming Soulful Prayer Flags workshop, which will be the first one held in my new studio space in the newly renovated 1600 Meeting Street building here in Charleston! We'll be gathering as a circle of women, declaring our intentions for the day and then immersing ourselves in delicious art making. It will be a truly transporting and inspirational day! Where: 1630 Meeting Street, Charleston, SC in the ground floor art studio of Faith Evans-Sills. What's included: All materials to create your own personal prayer flag, a gift bag full of special treats from Emily and Faith; bits of our art along with things to inspire and use in your project, a delicious catered lunch, coffee, water and tea all day. 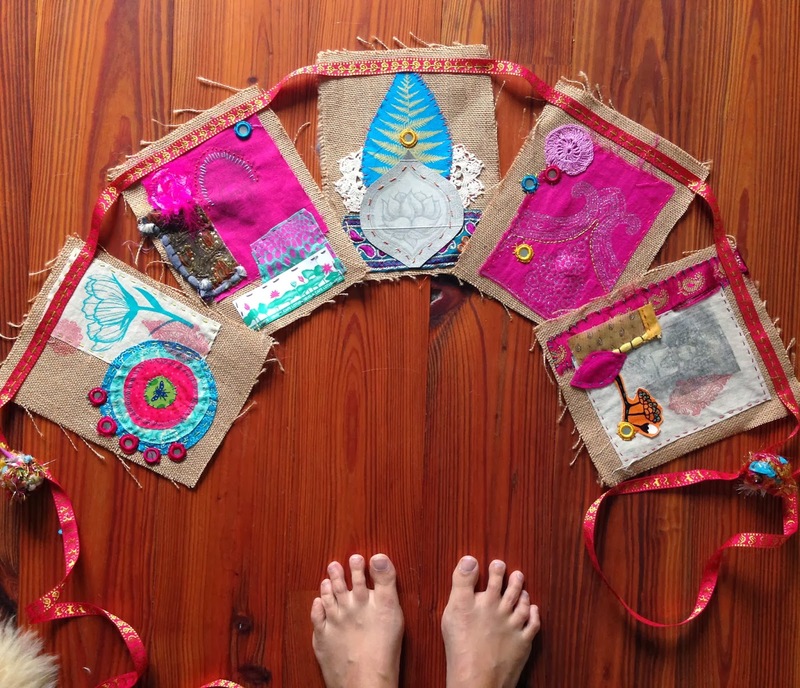 In this class we will be harnessing images from our daydreams to create a mixed media prayer flag that can be hung over a favorite spot in your home to remind you of your sweetest visions. Join us for a soul-filling day long workshop in Charleston, South Carolina, where we will gather as a group of women, declare our intentions for the day and then immerse our selves in delicious fabrics and paint for 5 wonderful hours of creating art together with a break at noon for a yummy catered lunch. Each participant will go home with a prayer flag of their own creation, made out of sumptuous bits and pieces of vintage textiles that we provide, there will be loads of loveliness from which to choose your materials. Your teachers, Em and Faith, bring years of art experience. In the course of the workshop each of them will offer a lesson on image transfer onto fabric and painting stencils onto fabric. You can use both techniques within the prayer flag that you create! You will add delicious textural layers and personal flair as you introduce paints, beads, stitching and images with personal meaning. We will provide all the materials that you will need for the class. The only thing that you can bring with you to personalize your flags are Black and White Photocopies (NOT ink jet) of personal and meaningful imagery. We'll also have lots of inspiring images on hand to choose from! If you have them we also ask that you bring a pair of good scissors with you. 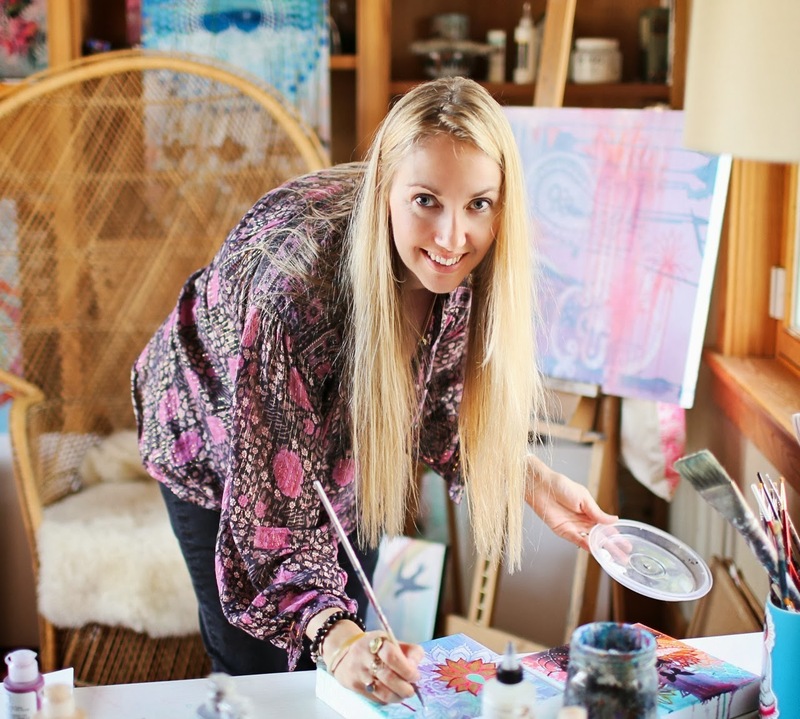 Register now and join us for the day of tapping into your own soulful creativity. Delight in the sheer joy of spending time creating with other women. 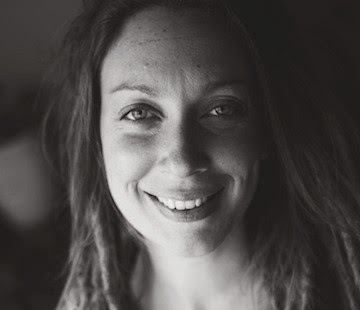 Em is a free-spirited native Australian living a creative life in a rural New England town with her husband and three little bean sprouts. She loves to make a cozy and colourful home for her family. One of her greatest pleasures is to use rescued and recycled materials to create collages, journals, clothing and all things that hang or dingle-dangle.